Invacare may be getting closer to resolving the FDA consent decree that's weighing down its results. Shares of Invacare Corporation (NYSE:IVC) climbed 12% today after the company reported that it expects the U.S. Food and Drug Administration (FDA) to initiate an inspection within the next 30 days of two facilities subject to a 2012 consent decree that's hamstrung the company's ability to design and manufacture wheelchairs. According to an agreement between the company and the FDA approved by the U.S. District Court in 2012, the company is limited in its manufacturing and distribution of wheelchairs and related components at its Taylor Street manufacturing facility in Elyria, Ohio. The decree also limited wheelchair and power-bed design activity at its Elyria, Ohio facility. Invacare has been working to resolve the FDA concerns regarding those facilities, and today, management reported it had submitted a third-party expert certification report to the FDA confirming the company's substantial compliance with FDA regulatory requirements, as well as the company's own report. Those two reports were necessary before the FDA would agree to inspect the two facilities. Management expects that the FDA will begin its inspection within the next 30 days in compliance with the consent decree. If that inspection goes smoothly, it will allow the company to return those facilities to full operation. The company's financials have taken a hit because of the consent decree and work necessary to address the FDA's concerns, so a restart of the facilities would undeniably be good news. 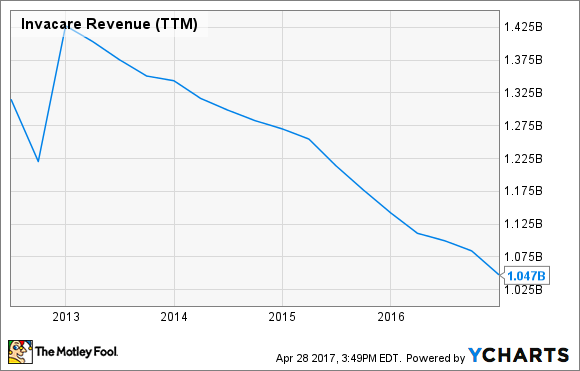 IVC Revenue (TTM) data by YCharts. However, there's no timeline for how long the FDA inspection may last, nor is there any guarantee that the FDA will walk away satisfied from its inspection. The company had taken steps toward winning an FDA green light back in 2015 only to face more questions that required addressing. Because of the uncertainty in timing and outcome, investors might want to take a more cautious wait-and-see approach to this company's stock rather than rush in to buy.